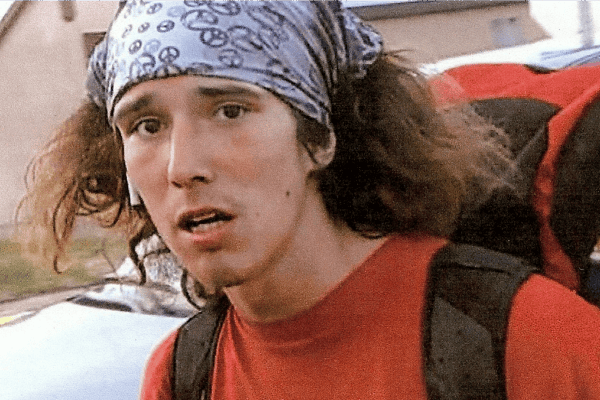 Kai the Hatchet Wielding Hitchhiker is on trial for murder in New Jersey. 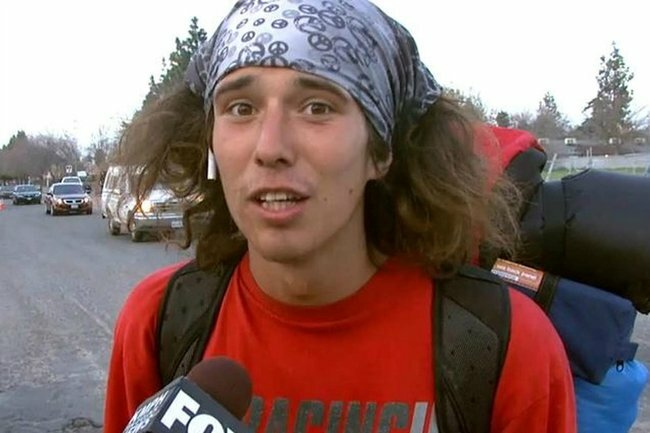 In 2013, a five-minute interview with a man known only as ‘Kai the Hatchet-Wielding Hitchhiker’ shot to viral fame. In the clip, Kai – a frizzy-haired skateboard kid wearing a bandana – described how he used a hatchet to save two pedestrians from an attacker. Speaking to local Californian news station KMPH, Kai explained that he had hitched a ride with a man named Jett when he suddenly crashed into a pedestrian, pinning them against another vehicle. Watch a clip from Kai’s viral interview below. Post continues after video. When another woman arrived at the scene to try to help the pedestrian, Jett jumped out of the car and attacked her in a bear hug. “He runs up and he grabs one of them, man. Like a guy that big can snap a woman’s neck like a pencil stick!” Kai told reporters. After pulling a hatchet out of his backpack, Kai repeatedly hit the attacker in the back of the head until he staggered away. Jett, who claimed to be Jesus Christ, was later arrested. Kai the Hatchet-Wielding Hitckhiker was a hero – and just like that, he became an internet sensation. Since then, the bizarre interview has garnered over seven million views on YouTube as well as dozens of YouTube remixes and fan pages in the man’s name. The hitchhiker, who did not disclose his last name or age, was even interviewed on Jimmy Kimmel Live in the weeks following the attack. 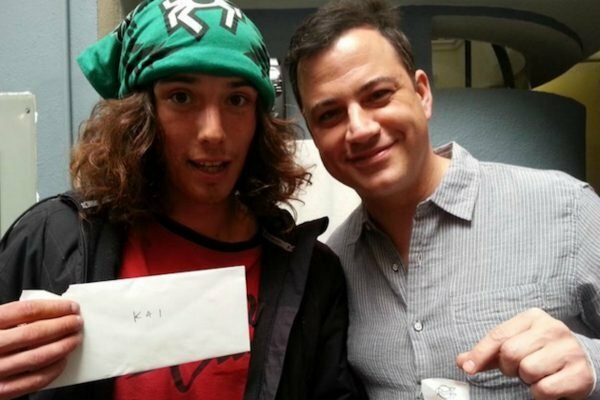 Kai and Jimmy Kimmel. Image: Facebook. “I’ve met a lot of cool people who have been reaching out through the internet, mostly contacting me through Facebook, there is about 10,000 messages in my inbox from people all across the country,” he told Vice in May 2013. But just three months after Kai became an internet sensation, the hitchhiker allegedly murdered a man. Now, almost six years later Kai – real name Caleb McGillvary – is finally standing trial for the murder. In the months that followed his sudden rise to internet fame, McGillvary continued to wander across America. It was on his travels that the then-24-year-old met 73-year-old attorney Joseph Galfy in New York&apos;s Times Square. According to reports in the Courier News, after sharing beers together, Galfy invited McGillvary to stay at his house in New Jersey. Kai – real name Caleb McGillvary – claims the attack was in self defence. Image: YouTube. The next day, on May 13, 2013, Galfy was found dead in his home. He had been beaten to death. 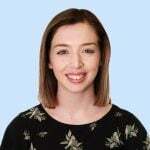 In a Facebook post which has since been removed, McGillvary claimed that he had been drugged and sexually assaulted on the night he stayed at Galfy&apos;s home. Since then, he has continued to claim that he fought off the man in self defence. He also pleaded not guilty in court to the murder charges. After his arrest on May 17, 2013, McGillvary called on his internet fans for help with his legal fees. A petition was also launched in his defence. Now, six years on from his arrest, the internet celebrity&apos;s fan base has predominately dissolved. As his trial continues, he faces life in prison if convicted.